Northern Trust has officially opened the first phase of its new industrial/workshop development, Gerards Park in St Helens. 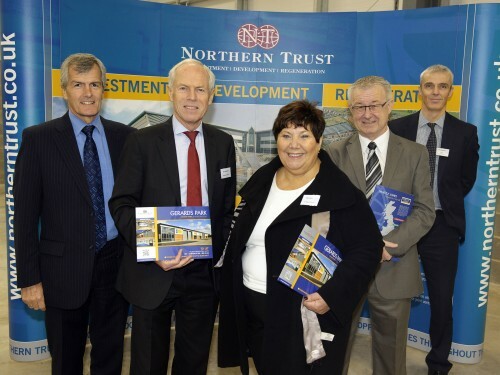 The 30,878 sq ft scheme, located off College Street was formerly unveiled at a breakfast reception on the 15th November when Northern Trust welcomed local dignitaries, council representatives, and members of the business community to the new development. With the assistance of European Regional Development Fund money, Northern Trust plans to develop out the site in three phases. The first phase of which comprises of 21 units split into three blocks with sizes ranging from 537 sq ft up to 3,789 sq ft. Units over 1,000 sq ft also include a fully fitted office. Concrete service yards will provide adequate circulation and loading facilities and there is ample car parking and quality landscaping around the scheme. The development has achieved a BREEAM rating of excellent. Gerards Park is located half a mile from the town centre on the main arterial route between the town Centre and the A580 (East Lancashire Road). The new development will be managed and marketed by Northern Trust’s in house management company Whittle Jones North West, and anyone interested in further details about the scheme can contact the team on 01257 238666.